Gladiolus (means small sword in Latin, refers to the shape of the leaves) is is a genus of perennial bulbous flowering plants in the iris family (Iridaceae). Gladiolus commonly called as Sword Lily. 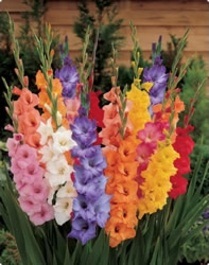 It also common named gladioli, gladioluses or sometimes gladiolas. The Gladiolus is a large genus contains about 260 species, of which 250 are native to sub-Saharan Africa, mostly South Africa. About 10 species are native to Eurasia. 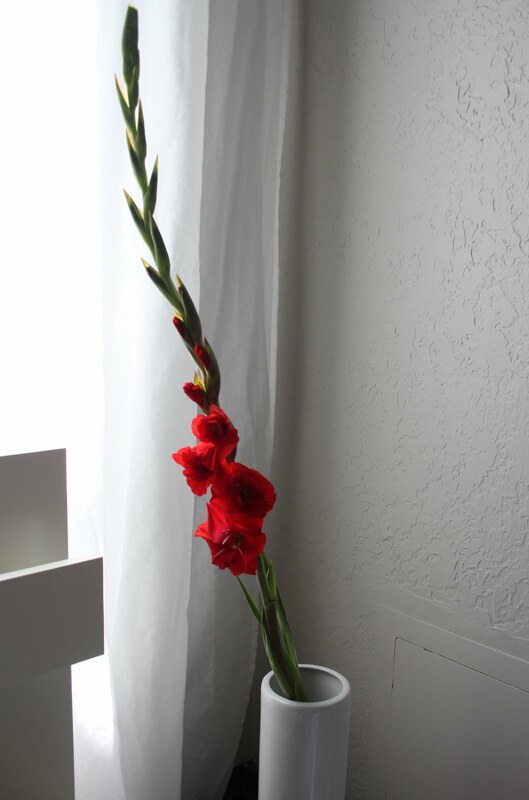 Gladiolus are attractive, perennial herbs and semihardy in temperate climates. They grow from rounded, symmetrical corms, that are enveloped in several layers of brownish, fibrous tunics. Their stems are generally unbranched, producing 1 to 9 narrow, sword-shaped, longitudinal grooved leaves, enclosed in a sheath. The lowest leaf is shortened to a cataphyll. The leaf blades can be plane or cruciform in cross section. The fragrant flower spikes are large and one-sided, with secund, bisexual flowers, each subtended by 2 leathery, green bracts. The sepals and the petals are almost identical in appearance, and are termed tepals. They are united at their base into a tube-shaped structure. The dorsal tepal is the largest, arching over the three stamens. The outer three tepals are narrower. The perianth is funnel-shaped, with the stamens attached to its base. The style has three filiform, spoon-shaped branches, each expanding towards the apex. The Gladiolus ovary is 3-locular with oblong or globose capsules, containing many, winged brown, longitudinally dehiscent seeds. In their center must be noticeable the specific pellet like structure which is the real seed without the fine coat. In some seeds this structure is wrinkled and with black color. These seeds are unable to germinate. 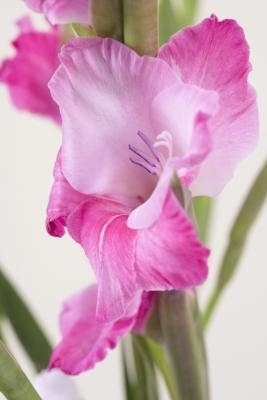 Gladiolus flowers are variously colored, pink to reddish or light purple with white, contrasting markings, or white to cream or orange to red.